Holiday bungalow in a tropical garden with pool. About 3 km to Nai Yang or Nai Thon Beach. 1 bedroom (AC), 1 shower / WC, open living and kitchen area on 60 m plus terrace. 1 open kitchen fully equipped, dining and living area. Private parking in front of the house inside the property. The bungalow was finished in 2016 and furnished with a high standard. 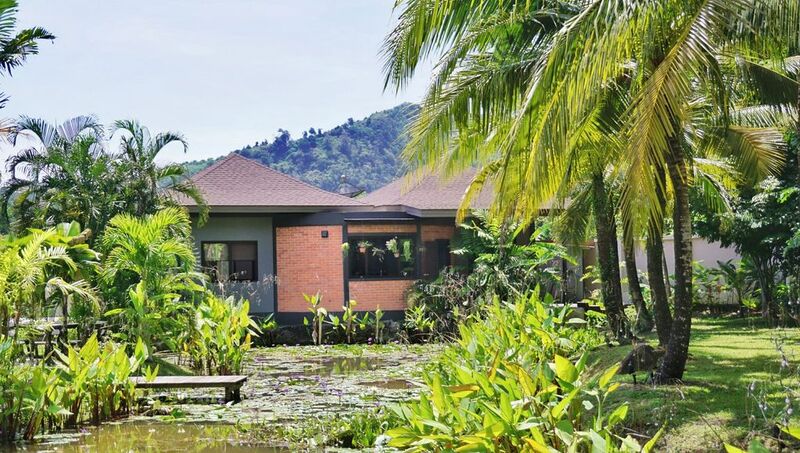 It is embedded in the property of the 'Villa Mangosteen' in the north of Phuket. The 2,700 sqm tropical garden, with 2 fish ponds, a variety of palm trees and giant shade-spreading trees. This place is ideal for those seeking peace and nature. The property has two lovely dogs. The transfer from the airport takes about 10 min. Shopping possibilities (24h) also only 5 min. away. Perfect starting point for boat trips to the nearby Phang Nga Bay, with its breathtaking rocks and caves. Other option is Trekking or rafting trips in Khao Sok National Park, 2 hours away, or even motorcycle tours to the neighbor-province Phang Nga.